Why have Genuine Dermaroller ™ treatment at Therapy House? If you would like your skin to have a brighter, healthier and younger appearance, Genuine Dermaroller ™ Therapy is an advanced micro-medical skin-needling treatment that will stimulate your skin to regenerate and repair itself naturally, boosting its collagen and elastin production to help your skin look and feel fantastic. We can use the Genuine Dermaroller ™ to improve the appearance of acne scars, sun-damaged skin, fine lines and wrinkles on your face and décolletage, stretch marks, cellulite and pigmentation. To carry out Genuine Dermaroller ™ Therapy, we use sterile single-use micro-medical skin-needling devices, where the quality and safety are guaranteed. Genuine Dermaroller™ products can only be used by trained medical professionals and authorised clinics. During the treatment, we gently roll the Dermaroller ™ over your skin to create thousands of tiny micro-channels or pin pricks in your skin. Although these micro-channels quickly close by themselves, it is enough to stimulate your body’s healing response and the growth of new collagen and elastin. The micro-channels provide tiny inlets that enable the cosmeceutical products we use during the procedure to go deeper into your skin. This is a popular treatment because it stimulates the skin to repair itself naturally and safely, creating brighter, smoother, healthier and younger-looking skin. What issues can Genuine DermarollerTM Therapy be used to address? We’ll ask you to come into the clinic for an initial consultation. This is a chance for us to spend some time talking about how you feel about your skin and your appearance. We’ll also analyse your skin and discuss your treatment options. Once you decide to go ahead with Genuine Dermaroller™ Therapy, you will need to come back for your treatment appointment. When you arrive, we will apply a topical anaesthetic to numb your skin – this takes about 30 minutes. Once your skin is numb, we will gently roll the Genuine Dermaroller™ medical device across your skin to create thousands of micro-medical needle columns (tiny pinpricks) in your skin. Each needle is about 0.1mm wide, so the columns close rapidly without leaving open wounds. In fact, your skin should recover within 24 hours of your treatment. Your appointment itself will take a further 20-30 minutes after the anaesthetic cream takes effect. 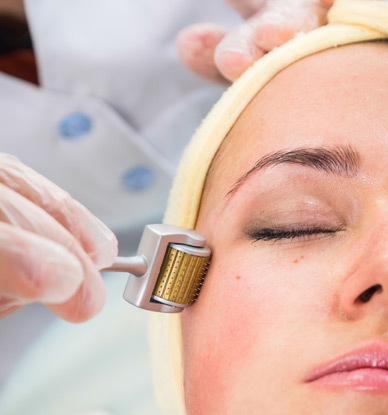 After your treatment, your skin will start to naturally regenerate and repair below the surface in the dermis. It may be up to six weeks before you notice an improvement – this is because it takes time to form new collagen, generate new skin cells, and enhance your blood supply. After six weeks, however, you should begin to notice your skin looking much healthier, with areas of scarring, pigmentation, sun damage, etc. looking significantly smoother and more even in terms of your complexion. The results for stretch marks, acne scars and trauma scars are permanent. For skin rejuvenation, how long the results last will depend on the rate at which your skin ages – every person responds differently. The Dermaroller acts by stimulating your own collagen but this will diminish again as you age. That being said, results are generally long-lasting – from six months up to two years – and we usually recommend annual or bi-annual ‘top-up’ treatments. Immediately after your Genuine Dermaroller™ Therapy, you will look as though you have moderate sunburn and your skin may feel warm and tighter than usual. This will start to subside after one to two hours and most people normally recover within the same day with only slight redness the following day. We will apply cream after the procedure to help soothe and calm your skin. We’ll also give you some to take home to use until the redness has cleared. Most people are able to carry on with their everyday activities, but if your skin does look a bit sunburnt, you may want to take some downtime until the redness subsides. You will be given detailed aftercare instructions that relate to your procedure. Generally speaking, you should use tepid water to cleanse your face for the first 48 hours post-treatment; dry your skin gently, always making sure your hands are clean when touching the treated area. We recommend that you don’t wear make-up for 12 hours after the procedure. Depending on your skin, we will recommend two to three procedures with around six weeks between them for you to experience the optimal results. You may need more to improve acne scars and other types of scarring. You may also want to discuss the benefits of following up Genuine Dermaroller™ Therapy with a treatment of Accent XL radiotherapy to further boost collagen production. Our Clinical Director, Dawn Attewell, appears on the Save Face register for safe non-surgical treatments, which recognises only appropriately trained doctors, dentists and nurses. She is also a National Trainer for Genuine DermarollerTM Therapy, so you can be assured that you are receiving treatment from one of the most skilled practitioners in the industry. Want to know more about Genuine Dermaroller™ treatment?